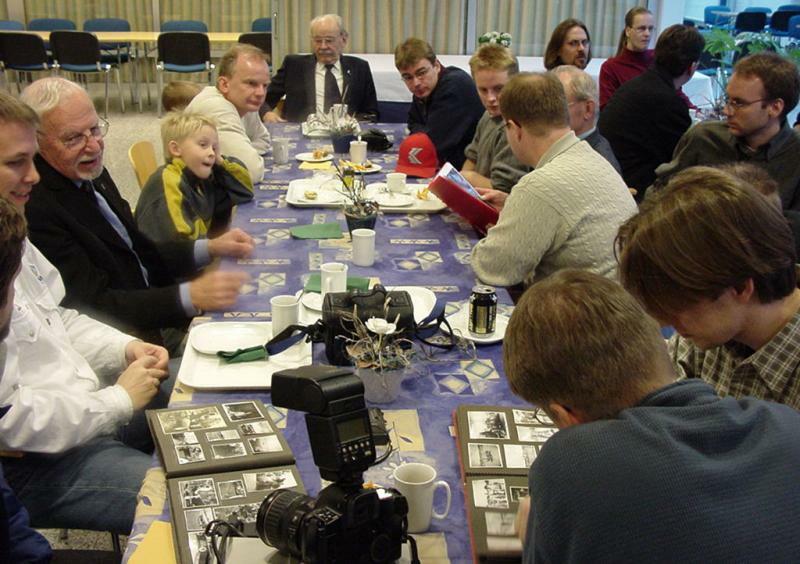 Café discussion with Kyösti Karhila on Dec12 2001. Present: about two dozen people. I was a Flight Leader then, one and only of reservists, I think. When promoted to Lieutenant I was 23 years in age. Looking at my son in that age I could not imagine him as a Flight Leader. Many people seemed to think that the duty of a fighter pilot belongs to young men. There probably were not many over 30 years in age? There were men up to 35 years in age, they were W/Os, everyone of them "old" at that time already. Yet they were engaged body and soul. Experience was the trump card. Did a 35-year-old Messerschmitt pilot find himself physically unable to endure something a younger man took in stride? Not in my opinion. They talk about the blackout and things, but that depends on the situation, how hard you have to pull... It is very individual. When I was in training in Kauhava there were wooden false barns in the Kauhava airfield. They were built on skis and just introduced. 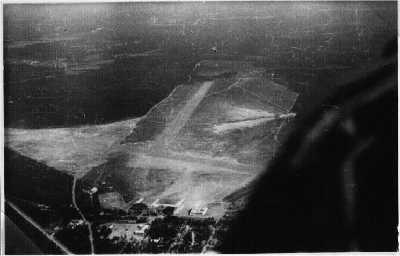 They were pulled on the airfield every night and in the morning they were removed. It was all in vain. In 1943 they were no more. 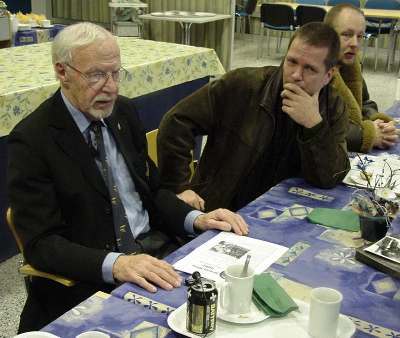 The co-operation between the Gefechtsverband Kuhlmey (the German flight unit arriving in summer 1944) and Finnish Air Force started even though the Germans considered they did not need any help from the Finns. They had written orders on that. Very soon they found co-operation useful and the order can be forgotten. 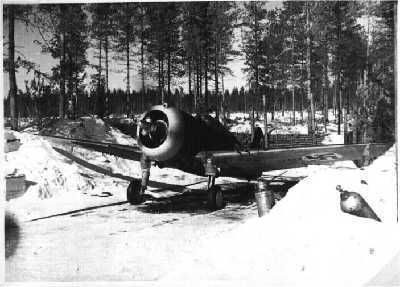 Warming up the Curtiss, "Sussu", at Suulajärvi. In your album here is a pic of the Suulajärvi a/b. Were there any actual runways or was the entire circular area usable everywhere? At least in winter, when there was a lot of snow it was plowed off or rolled down. Did you just taxi downwind from the "parking place" for takeoff against the wind? You were able to taxi a little according to the wind direction. Was it easier to land on a softer surface? That is true, the worst characteristic of the Messerschmitt was her bent on veering at takeoff and landing. In this photo there is a propaganda poster on the wall. Is it a Russian poster? No, it was drawn by Pallasvuo. He was quite an artist, it is one of the pictures he drew. It represents a LaGG-3. Was it easy to recognize enemy planes? Did you have good reference pictures or did you just guess which type a new looking one could have been? We had silhouette diagrams but else little. Only type I remember to have guessed at recognizing was the I-16bis. I did shoot down one, it was not I-16 but I-16bis. 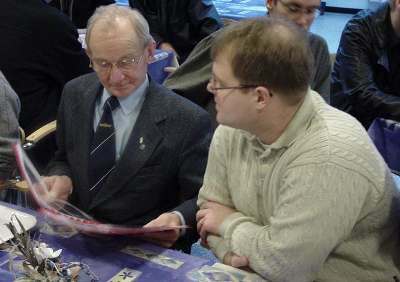 Afterwards Mr. Soiri, the author of the book "Iskulaivue" showed me a model and told it was called I-183. I remember reading from some book that there was one being tested but the project was cancelled because it was not good enough. Well, they told that they are two completely different aircraft, even when looking at the silhouette from above. Even the difference in size is considerable. They must have been the A-36 version, without the bubble canopy. But there are six Mustangs shot down in the Finnish front. I got two of them. The first type in the Finnish front was initially the Tchaika, by the way I never saw a I-15. There was the Tchaika, the I-16 and LaGG-3, MiGs, Yak-1... These types were confirmed by our radio intelligence. There were Hurricanes and the Airacobr The Airacobra was seen in the final months of the war, it was equipped with the huge 37mm cannon. When it was fired you could see the tremendous flash and a smoke ring through which the plane flew. Can you remember anything about the two Mustangs that you bagged? I got both in a turning battle, out-turning them. We did several times 360 degrees until he became nervous, then pulled a little too much. His plane "warned", the pilot had to give way a little and I was able to get deflection. When I got to shoot at the other one, the entire left side was ripped off. So you did several full circles, you must have flown near stalling speed. Did you fly with "the seat of your pants" or kept eye on the dials? What was the optimum speed in such a situation, it was level flight? It was level flight and flying by "the seat of your pants". What should I say, I should say I was doing 250kmh and the Mustang must have more than 300kmh. That is why I was able to hang on but did not get the deflection. And you was flying a three cannon plane? Yes, but I did fly another one as mine was under maintenance. It was the experience that counted. Experience helped to decide when you had tried different things. In which altitude did these Mustang dogfights take place? It must have been about 2000m. Your opinion is that the Curtiss was in principle a high class plane and pleasant to fly? It was indeed, flying and mechanical quality. I used to admire the cockpit plexiglass quality. Sunlight did not affect it unlike that of the Messerschmitt. There was not even the blue tint. Comparing that with a Messerschmitt canopy, through that you could see but... . The Curtiss windscreen did not include any bullet proof glass, it was just one piece. What kind of gunsight was the Curtiss equipped with? It was a reflector sight, a little offset from the center line, the pilot is sighting with one eye. The German planes also had off-set gunsights, but just a little. The supports for the Curtiss gunsight were placed inside the cockpit. You mentioned that the Germans applied a tight wingman tactic, there always was a wingman for one who did the shooting. How was that in the Finnish air Force? Was there more freedom for the wingman? We did fly in two plane patrols. Here was the 1st patrol and over there the 2nd patrol. Everyone saw each other and behind each other. It was not always possible to stay in formation, but mostly you could hang on. 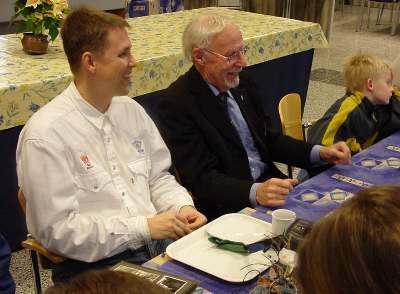 Kyösti Karhila hunts a Pe-2. MP3 file. In FINNISH. Lenght1:43 min, 710 kt. This was our standard tactics in Olonez when hunting a Pe-2. Our airspeed indicator did not provide the necessary readings by far. We found out that the enemy used to fly up (NW) along the coast of Lake Ladog Then they would approach from the East over the Nurmoila air base and along the railway line, observing traffic and photographing. When we received a report about aircraft engine sound over Ladoga, we took off as soon as possible and climbed N of the base. There we were cruising around and waiting. Then the enemy came. (Describing the battle with his hands. )This is how I fired at one Pe-2, I hit him in the cockpit. He caught fire and dived. The observer bailed out but his clothes had caught fire. His clothes were smouldering all the way down as he hung under the parachute. The pilot bailed out without mishap and I met him later. What about the radio equipment, were they good enough? Initially we had problems but as the technicians learned to adjust them they started working. The first WW pilots had a fear of burning and some carried a pistol to get a more "pleasant" death in case. The planes of the Second WW must have been better "fireproofed" and fire was not such a fear factor, was it? A Messerschmitt pilot was sitting on the fuel tank, in fact ? That is true but the fuel tank was covered with rubber that after penetration by a projectile sealed the hole. Only if the fuel exploded was the end at hand. Did the Curtiss have self-sealing tanks? There have been arguments about the Curtisses equipped for the French service. The ones in the Finnish Air Force had been used by the French. And by Norwegians. Quite a lot of them were delivered from Norway (by Germans, tr.rem.) They were still in crates, brand new ones. There are very exiting things about the Curtisses. For example the Curtiss Aircraft Company promised that a Curtiss (A-75)would do 511kmh with a Pratt-Whitney (P-W) engine which is quoted in all books. What is your view on the matter? No, no. It was four hundred and fifty. A Cyclone powered Curtiss did 485kmh. Do you have any idea how is it possible that the Curtisses in Finland were found to be so much slower than the manufacturer claimed? Was it a case of plain lying? Look, a plane custom made for representation could be polished as well as possible, all the cracks were filled up and so on. A lot of advantage could be gained that way. The planes used in the front were not similarly treated, it cut the speed. And when testing there was no limits in using the engine. An engine could be worn out just to get good performance readings. I have read the brochures sent to the Finnish Air Force by Curtiss and it is a real shame that these planes were not purchased before the Winter War. The offered planes were equipped with the Cyclone, by the way. The brochures mention that the top speed has been gained with the "max 5min" power setting, the climbing rates likewise: the first 5 minutes with emergency power setting. This could explain the matter partly. In those days she climbed pretty high in five minutes. It could have been five minutes fifteen to 5000m. I could do it below four. One possibility is that more could be gleaned from those engines with the 100 octane fuel that the Americans had but we didn't. I do not think the French had it either. The planes could be waxed and polished, to make them "more slippery". That depended on the time, materials and possibilities available. Lipfert used to have his aircraft polished. Heinz Knokke tells in his book how a mechanic was angry when a just waxed and polished fighter was lost. The control system could fail? You noticed it in the rev counter and could hear. Both rev counter and boost pressure dials were there and neither could be allowed to go over the limit. MP3 file. In FINNISH. Lenght2:32 min, 744 kt. The most important thing is to see the one coming at you. To spot one coming at you, be it upper or lower sector, front or rear, is the precondition of surviving. Observing the surrounding airspace is the key factor. I had excellent eyesight at the age of 18 years. I used to be the first one to see. At what distance could a plane be identified as friendly or enemy? The silhouette. If you saw the rear silhouette you could deduce basing on the colour of the plane. The Russian planes used to be more light in colour or green. When closer, the shape of the plane gave cues. Did the cannon and the MGs have separate or common trigger? Here, in this photo, this is the cannon trigger. This cover is flipped over and you are ready to fire. This button lower down is the MG trigger. When flipped back it also is the safety. So the top trigger is the cannon and the MG one below. The Messerschmitt was equipped with two 13 mm MGs in the nose, were there muzzle flames or anything else visible in the cockpit when shooting? You see just the tracers if any. No glare, no flames. The rate of fire of the MGs was so high that you cannot see anything. The cannon ammunition comprised five types of shells each smoking in their way. There were high explosive, armour piercing, tracer and some other types. Could the pilot tell which type of ammunition was loaded in his plane? It would have been possible if the pilot only had bothered to ask. But this was a good selection, high explosive and armour piercing shells. The high explosive was not a tracer. Where is the tangent for the transmitter, in the stick or some other place? It is the one over there. I can remember where it is but I cannot recall which finger was used to press it. This is the power lever, there is a rocker switch on top for adjusting the engine revs - or the prop pitch in a way. The prop was automatically adjusted, but you could adjust the pitch manually in case the automatic system broke down. But could the pilot control the leading edge slats? No. The slats were extended when the speed decreased enough, you could feel when they were extended. Wing slats and Messerschmitt 109. MP3 file. In FINNISH. Lenght2:24 min, 990 kt. The Messerschmitt became stiff to steer not until the speed exceeded 700kmh. I once went into vertical dive and the speed was far more than 800 kmh. The plane did not vibrate but as I pulled the stick it did not move. I came out of a cloud off Helsinki over the Gulf of Finland and began to pull. As nothing happened I broke into a sweat of agony: I am going to crash in the se I pulled with both hands as hard as I could and she began to recover. My altitude must have been less than 5m from the sea and as I let her climb with the speed she had I found myself over the coast of Estonia. In this high speed recovery you did not have enough G to black out ? There was a lot of G thinking about the speed. But you could not make your plane bend like a clasp-knife. Did you get tunnel vision due to G force? I did. Recovery from it depended on your plane and the situation. With the Curtiss you could bank and get a high G.
MP3 file. In FINNISH. Lenght2:41 min, 780 kt. Messerschmitt 109 G2 and G6: when both were in good condition which one was the more pleasant? It was the G6 due to the better armament, it was a great plus. Thinking about the ammunition capacity the nose cannon had a fairly small magazine. Maybe 180 shells. All cannons were fired with one pushbutton, the MG button was under the index finger. There were also two buttons. The triggers were electric. The safety was flipped over the triggers. In this position the safety was on. It was possible and easy to use both triggers at the same time, because they were electric. Did you fire with all weapons at the same time? Depending on the situation. For example in Tali I fired at an IL-2 with all weapons. Did you at first fire the MGs and when hitting the target, used the cannon? Again it depends on the situation. If the target was very near the fuselage MGs would hit the target. The (wing) cannons could miss the target on both sides in that case. But usually I fired with all guns. As to the IL-2 rear gunners, was there a reason to be wary of them? It made sense to be wary of them. The closer I am the closer he is. When engaging an IL-2 did you try to keep in cover of his tail or did you approach from side? The Germans claim that there was an oil radiator in the belly of the IL-2, which was fairly unprotected and it was a good spot to hit. I cannot recall whether the IL-2 had an (external) oil radiator. But several Russian fighter plane types featured radiators, either extendable or else adjustable. Just as the Messerschmitt was equipped with radiators in the wings. The air intake was a large opening near the fuselage, and the outlet was adjustable. The automatics adjusted the system according to the temperature of the glycol coolant. Was it possible to adjust the radiators manually? Of course you could shut the flaps, the effect on speed was minimal. (Showing the position of air intake and outlet in the wing in relation to the fuselage.) If you took a hit there, the glycol would leak out. But you could shut off (the damaged radiator). Were the Finnish planes equipped with the shut off valves? Was it so that the radiator flaps had to be open at takeoff, the engine would overheat easily? Yes, it was absolutely necessary to take off as soon as possible to avoid overheating. The first 30 of the G2 were delivered right from the factory production line. After that the delivered planes were more or less used, they were rebuilt. Also the first of the G6s were new, then later deliveries were rebuilds. The Germans did not make any distinction between new and rebuilt planes, the rebuilds were upgraded with new gear. The used planes were however found to be more awkward in use. They were unfinished. Some individuals could in higher speeds be held in straight course by constant application of vertical rudder. You had to throttle back as your leg began to shake and you were no more able to keep the pedal down. It got the worse the more speed you had. This kind of things. The planes used to veer to the right at takeoff and when airborne to the left. Products of the wartime, I say. Yet some 32000 of them were made after all. The 109 had the lowest production cost. Least labour and materials and so on. That is why we got the Messerschmitts. We were hoping to get Focke-Wulfs, because there was the undercarriage problem (of the 109). The F-W undercarriage had been constructed by the designer to be able to take 250 per cent strain. I have seen in Malmi how one (F-W) landed, veering to the left. It was wintertime, the runway was ploughed and the snow piled in banks on both sides of the runway which was clear from snow. The snow bank had become more than a meter high, the F-W went through the snow. She went right through the snow on the other side. The pilot just applied some power, turned and came right back through the snow. 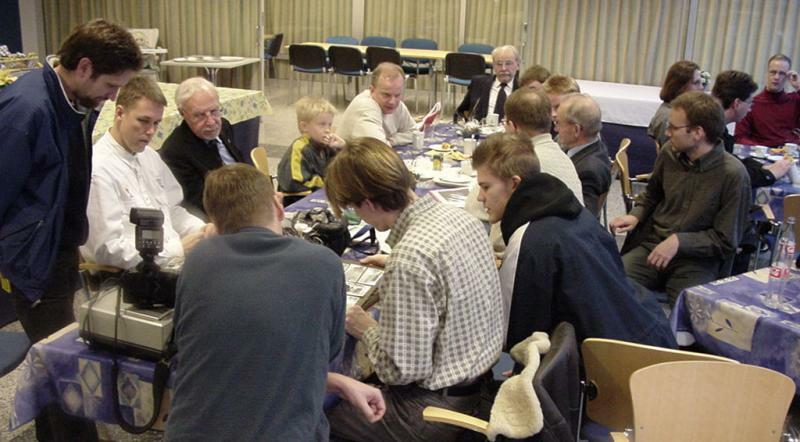 On this page you find the café discussions with Kyösti Karhila done on on Dec 12th 2001 at the Finnish Aviation Museum. Copyright VLeLv Icebreakers / Virtuaalilentäjät r.y. / Finnish Virtual Pilots Association 2001-2003.